World renowned cosmetic physician Dr Greenberg is founder of Youtherapy Medical Spa and Youtherapy MD medical grade cosmeceutical skin care line. Featured on CBS the couch, Channel 11 news, The Today Show for fillers, Anderson Cooper, CNBC, The Best of Westchester, Social Life Magazine, BEST DOCS, New York Magazine, Time Out NY and more. Dr Greenberg is New York’s Go-To-Doctor when it comes to wanting to look and feel your youngest with the comfort of cutting-edge technology ─ minus the incision. 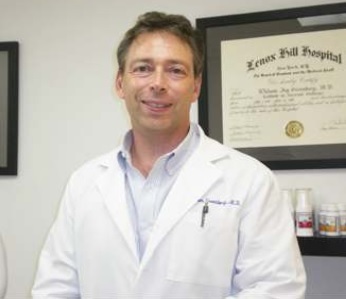 His work specializes in obtaining natural results without the risk of surgery. Dr Greenberg envisioned a med spa enhanced by the benefits of combining medicine and science, only offering treatments he wholeheartedly believed in. He recognized this dream by opening his first practice, Youtherapy Cosmetic Medical Spa, located in New York City on 238 East 77th Street, where luxury treatments meet technology and science in a comfortable and medically driven setting. This combination of medicine meets science enables him to reverse the signs of aging by lifting, tightening, resurfacing the skin, and removing unwanted fat with the utmost modern FDA approved technologies today. Dedicated to helping patients discover that they no longer have to live with bothersome imperfections brought on by aging, Dr. Greenberg has made his services even more available by taking his expertise in medical cosmetics closer to home and opening a second location in Scarsdale. Dr. Greenberg plays an integral role in making Youtherapy an innovative and unique destination for those seeking the best in medically supervised skin care, Providing 25+ years of medical experience and his expertise in assessing and implementing the newest state-of-art technologies to improve the practice of medicine. Dr. Greenberg has been celebrated throughout New York as a primary cosmetic specialist, not only for his medical skills, but also because he has an eye, imagination, and the compassion that stands him out from rest. After years of watching his clients come to him using over the counter not biologically available products, that offered no results. Dr Greenberg was driven to design and formulate a cutting-edge science based cosmeceutical line called Youtherapy MD with active biologic ingredients with patented delivery systems. From Stem cells, Peptides, Penetrating Lipids, Antioxidants, concentrated acids, and more, these products have a direct clinical effect on the quality and texture of the skin. Over-the-counter and drugstore remedies only get you so far. When you’re ready for true quality and dramatic results, it’s time for Youtherapy MD. With real science and clinically proven technology,. the Youtherapy MD line takes the best of the pharmaceutical world and synergizes it with the most potent enzymes, antioxidants, green teas, and more. Dr Greenberg’s product line leverages the best attributes of eastern and western medicine to deliver best in class results. Our high-tech skincare line delivers flawless, ageless-looking skin in minimal time—just what you have always been looking for. Medical grade skincare products differ from those found at your local drugstore because they are held to a higher quality standard, are backed by scientific evidence, and contain patented blends of recovery and growth compounds that are formulated to effectively rejuvenate the skin. Dr. Greenberg graduated as an engineer from Tufts University in 1983 and attended New York Medical College where he earned his medical degree in 1987. Dr. Greenberg received postgraduate training at Lenox Hill Hospital in Manhattan before going on to practice medicine.